Look here! We do lots of events. Workshops! Salsa! Movies! Open Mic Comedy! Have a look below and feel free to send us ideas! By Who? Kath from YogaPlot brings a dozen years working as a children’s educator to deliver a playful storytelling yoga program that engages kids in mindful movement, structured calm and boundless imagination – so you can relax and have a cuppa! Sign up? Send us an e-mail at info@playfulgrounds.com or sign up at the café! Happily Ever After isn't happening here, but it's real close by and will probably be a lot of fun for the kids! In addition, some of the characters will be here this Saturday, March 9th to do some songs and stories and have their pix taken with the kids! Come and join your neighbourhood Music School celebrate early childhood music in a free circle time music class. Amici School of Music will lead a Music Together® class at Playful Grounds. Music Together® is an internationally acclaimed early childhood music program that has grown to be the best loved music program in Toronto. For Children 0-5 and those who love them! Sign up to join the class. Sign up? Send us an e-mail at info@playfulgrounds.com or sign up at the café? Traditional Chinese Medicine (TCM) is a unique system of medicine that recognizes every little sign or symptom as being relevant and you're body's way of 'talking to you'. In Chinese Medicine no two people are treated the same way as their underlying patterns can be vastly different. By helping you to understand what's going on AND what you can do to help balance things out, TCM seeks to empower the patient and help you feel the best you can. Come and learn the basics of TCM and the unique approach to food and nutrition to help you optimize your health and feel better. Sometimes it's the simplest things that have the biggest impact! Sign up? 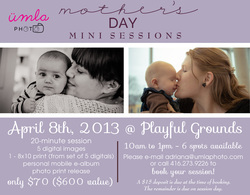 Send us an e-mail at info@playfulgrounds.com or sign up at the cafe! Join us for Fun, Food and a good Read! It's a book launch and it's free! The event is from 4:30pm to 6:30pm. Come out and enjoy! Mother's Day! April 8th so not on Mother's Day but for Mother's Day. Here is your chance to get a pic or your wee one, or of yourself and your wee one and get the pics back in time for Mother's Day. There are actually only a few spaces so you need to sign up fast. Do it here. Hey. It’s important! Stuff that will be covered: *The benefits of having a Registered plan VS not having a plan or using another savings vehicle. * The different types of RESP companies out there and their differences. * Grant money to put towards your child’s education available from the government and how to access them. * How to ask questions about interest rates and fees in different plans and how to best budget for one. By Who? Sharla Finn is licensed for Ontario with the RESP Association of Canada. RESP stands for Registered Education Savings Plan. A savings vehicle offered to help parents save for their child’s secondary education. We will explore issues, discuss effective strategies, and develop skills to support your new role and identity. There will be time for Q & A. Handouts will be provided. Focusing on using our innate creativity to guide us through the changes that parenthood brings, identity, in relationships and the temporary pause on our careers.